As the most prominent and highly revered of all sports competitions in the world, the Olympic Games represent years of physical endurance and perseverance for athletes. With more than 200 nations participating, the Paralympic Games are no different. The Paralympics are held directly after the summer and winter Olympics allowing athletes with a wide range of physical disabilities to compete in a range of sports. Using Stratasys 3D printing technology one participant was able to overcome her back brace design restrictions in her quest for a medal. In order to overcome the limitations present in the design of conventional back braces, Latvian wheelchair fencer Polina Rokova sought a 3D printed solution. Eighth in the Women Category A world ranking, Polina needed a back brace flexible enough to withstand her rigorous training routine in order to better train to compete and perform at her highest level in the Rio games. Teaming with Stratasys gave Polina the opportunity to gain a custom-fit and comfortable brace that was specifically 3D printed for maximum movability allowing for much more flexibility in her training routine. Before the back brace was printed, Polina struggled with generic large and cumbersome back supports that were uncomfortable and limiting. Using a 3D scan of her lower back technicians set to work, digitally designing the custom-fitted back brace, focusing on the support of her middle spine. It was important to match the geometry of Polinas spine precisely in order to overcome any risk of damage from high-impact sudden movements often experienced in the fencing sport. 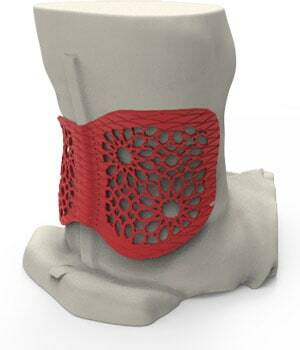 Using Stratasys Nylon 12 3D printing material the team were able to produce a flexible and lightweight back brace which has been integral to Polinas stringent Paralympic training routine. Polinas original back brace was unnecessarily oversized and ill-fitting causing discomfort and bruising almost every day, ultimately hindering her fencing performance in preparation for the Paralympics. 3D printing acted as the perfect solution by offering the ability to quickly and cost-effectively produce one-off creations which are customised to the individual. The decision to use Nylon material was central to maximising Polinas comfort and freedom of movement in order to compete alongside the very best in her field. The customised back brace itself was 3D printed on a Stratasys Fortus 450mc using FDM technology to ensure the brace was durable and lightweight with unparalleled toughness. It was able to be printed within a matter of hours in a single build enabling Polina to test various iterations of the back support during training. Each new iteration was a step closer towards meeting her requirements with the final version accompanying Polina all the way to Rio de Janeiro. 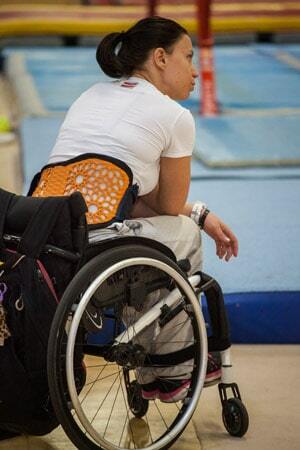 “Throughout my years as a professional wheelchair fencer, I have been looking for an alternative, and most importantly, a sports-appropriate lower back brace to allow me to fence and move freely without any restraints or pain”, said Polina.